WxL(in) 6” Casters Cat. No.’s Wgt. 14 gauge sheet metal 4’ high on 3 sides. 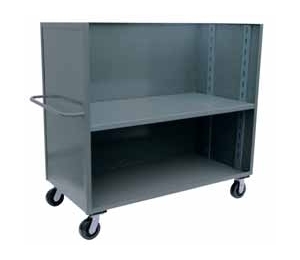 Adjustable middle shelf is standard — adjustable on 3-1/2" centers — see options for additional shelves. Bolt on casters, 2 swivel & 2 rigid, for easy replacement and superior cart tracking — see specifications chart. Clearance between shelves — 13".